Since my oldest has now asked to have chili mac 3 times since I first made it, I was planning on making it for dinner last night. Well, I got really busy doing some things around the house, and before I knew it it was too late to start the crock pot. So I adapted the crock pot recipe to make a stove top version and it was tasty and very well received. In a medium skillet, heat olive oil over medium-high heat and cook onions and garlic until soft; then add the chili powder, cumin, oregano, salt, and turkey and cook until turkey is cooked through, stirring occasionally to break it up. 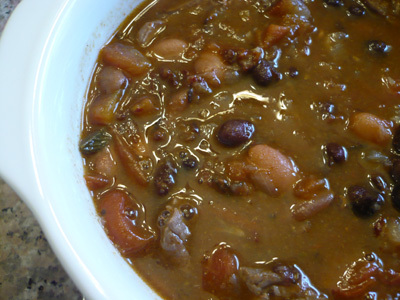 Add the tomatoes and kidney beans to the meat mixture and combine. Cover and simmer for 15 minutes or so. 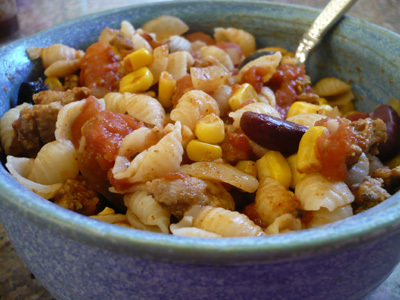 Stir the cooked pasta, corn, and olives into the chili. Top with cheese and sprinkle with cilantro and/or any of the other toppings. These recipes are adapted from recipes in the April 2008 issue of Cooking Light, and they are both delicious! Very bold refreshing flavors that make for a tasty summer meal. Chicken Marinade: Combine soy sauce and next 5 ingredients (through garlic) in a large zip-top plastic bag. Add chicken to soy sauce mixture in bag; seal. Marinate in refrigerator 30 minutes, turning bag occasionally. Cucumber Salad: Combine cucumber, shallots, and next 6 ingredients (through chile) in a large bowl; toss gently. Cover and set aside. 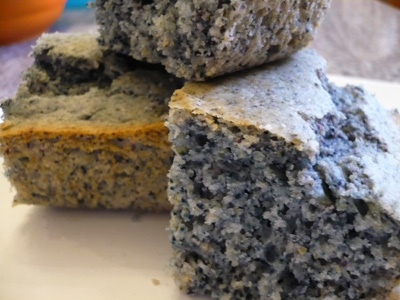 Yes I’ve made cornbread before, but this time I used blue cornmeal instead of yellow cornmeal, and what a treat it was! Everyone loved it, but that doesn’t surprise me one bit. Bake at 350 for 1/2 hour or until a knife inserted in the center comes out clean. This week’s crock pot recipe comes from the April 2007 issue of Cooking Light. It was really good, and not spicy, which was good for the kids, but we added some chipotle to our bowls to give the chile a bit more punch. I also made it thicker by making a cornstarch slury, because I like my chile a little thicker than this recipe turns out. -s really enjoyed it, and it’s one of those dishes that doesn’t taste like it was made from a crockpot. Our oldest has been asking for chili mac, so I mixed some of this chile with some pasta. He liked it, but he definitely loves that chile mac, so we’ll be having the chili mac next week. 3 chipotles with adobo sauce, minced. Heat olive oil in a large nonstick skillet over medium-high heat. Add onion, garlic, and beef to pan; cook 5 minutes or until beef is browned, stirring occasionally. Combine beef mixture, tomato, and next 6 ingredients (through broth) in an electric slow cooker. Cover and cook on HIGH for 3 hours or until beef is tender. Uncover; cook 30 minutes or until slightly thickened. If you’d like it thicker, remove about 1/2 c. of liquid and put in a bowl; then mix in 1 tsp. of cornstarch; dissolve the cornstarch; add back to crock, and bring to a boil. Stir in salt, if desired. Top with chipotle, sour cream or whatever you like. This was a clean the produce drawers out kind of meal. 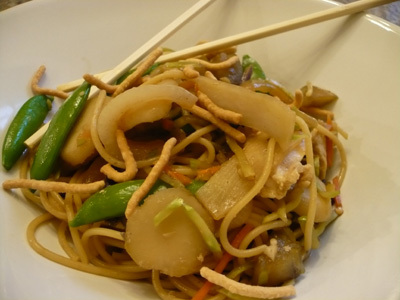 I’ve made Chow Mein, once before, and the additional veggies and chicken made this dish very good, and very kid friendly. I try to sneak as much veggies as I can into my kids…sometimes it works sometimes it doesn’t. Tonight they weren’t much into the veggies, but -s and I really enjoyed the dish! Get the pasta water started and cook pasta according to directions on box. Heat oil in large nonstick skillet or wok over medium high heat. Add garlic and ginger, cook for 1 minute, then add the chicken, saute until chicken is cooked through. Remove chicken from skillet, keeping as much as the garlic and ginger in the pan as possible, and keep the chicken warm. Add onion, eggplant, and broccoli slaw to the skillet, and saute until veggies begin to warm. Add Yoshida’s and continue cooking until your veggies are done, about 5 to 7 minutes…not exact science here. Add the snap peas, water chestnuts and bamboo shoots, and toss to warm. When pasta is done put it in a large bowl; then add the cooked chicken and the veggies, and toss to combine. Add more Yoshida’s if desired. Serve with crunchy chow mein noodles on top. I love curry chicken salad. It’s so easy and so delicious. The sweetness of the grapes goes so well with the curry. 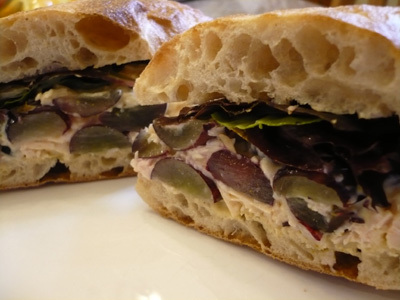 Combine chicken, mayo, curry powder, and grapes. Place the chicken salad on a roll and add some lettuce. This recipe comes from the August 2006 issue of Cooking Light. 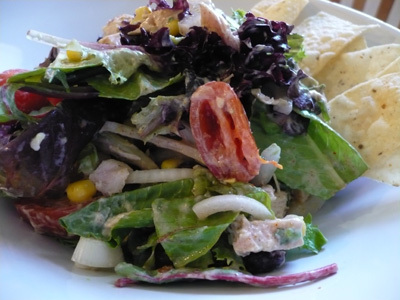 Great salad for a warm summer day…flavorful, light and refreshing, yet filling and delicious! We have the great luxury of living near the War Eagle Mill. They have a fabulous selection of organic whole grains. This past weekend we took the kids there to see the operating water powered grist mill, which they were fascinated by. We bought a whole bunch of the grains. We are also super lucky that since it’s local, even Walmart carries much of their grains, but the Mill has a huge selection. 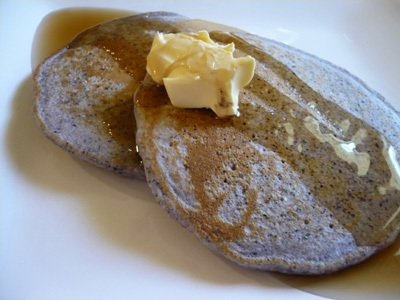 We bought some blue cornmeal , and right on the sack of cornmeal is a recipe for Blue Cornmeal Pancakes, and they were delicious! In a medium size bowl, mix dry ingredients together; stir in egg, 1 TBSP oil, and milk. Preheat griddle on medium heat, coat with 1 tsp. oil. Pour out batter by 1/4 cupfuls to make a small griddle cake. Flip when edges are dry and cakes are bubbly. I found this recipe at Stephanie’s Kitchen and thought it sounded really good. I gave it a whirl and it tasted really good. -s thought it was good, but too vinegary. He’s not a big fan of vinegar. 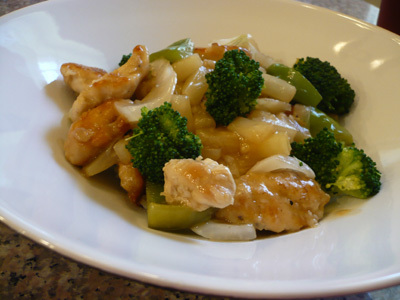 I used cider vinegar in this recipe, but interestingly he loved the sweet and sour sauce recipe I made a few days ago, and in that recipe I used rice wine vinegar. 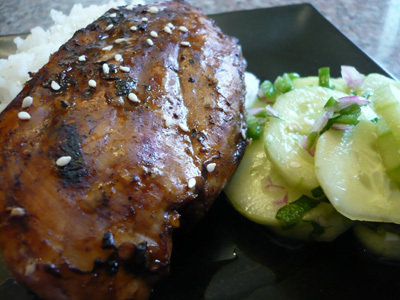 When I make this recipe again, I will certainly use rice wine vinegar! Heat some olive oil in a nonstick skillet over medium-high heat; then add the onions and peppers and cook until the veggies just start to get some color and are tender but are still crisp, about 3 to 4 minutes. Remove from skillet and keep warm. Combine flour, 1/2 tsp. salt, 1/2 tsp. pepper and chicken in a ziploc bag. Toss to coat. Heat more olive oil (about 1/4 c.) in the same skillet you cooked the onions and peppers. Add the chicken and saute until the chicken is browned and cooked through. Remove the chicken from the skillet and keep warm. Meanwhile blanch broccoli in salted water, until tender; drain and set aside. Combine the brown sugar, vinegar, soy sauce, pineapple juice, 1 tsp. salt, and 1/4 tsp. pepper in the skillet and bring to a boil. Meanwhile, combine the broth and cornstarch in a small bowl. Once the skillet mixture comes to a boil, add the broth and bring back to a boil. Add the onions, peppers, pineapple tidbits, chicken, and blanched broccoli; toss to coat and serve over rice.